To see all Products, please click! To see our all Services, please click! To see all Patents & Brands, please click! To see our Online Catalogue, please click! We produce gold to make your world easy and valuable. The history of paper money is an account of abuse, mismanagement, and financial disaster. The dollar isn’t worth its weight in gold, and the pound isn’t worth its weight in ounces. The desire for gold is the most universal and deeply rooted commercial instinct of the human race. İSGOLD has been introduced as a further measure of the quality commitment of the company in order to producing only the best and most reliable product. Each product is sealed and packed in protective İSGOLDSecure™ packaging certificate which guarantees the assayed fine precious metals content, weight as well as quality. İSGOLDSecure is one of the globally registered trademark of ISGOLD which guarantees the assayed precious metals content, weight as well as quality stated on the secure gold packages. The authenticity of precious metals packed by ISGOLD is under guarantee through ISGOLDSecure including various security layers and systems. The durability of ISGOLDSecure certified packages has been proved by implementing various harsh physical and mechanical applications. Hence, ISGOLDSecure certified packages have waterproof and non-manipulated packaging feature. You will be delighted experiencing ISGOLD services, products and innovative solutions. Each product has been produced providing with the weight, fineness of gold and dedicated serial number, official ISGOLD stamp as well as Certification Mark. ISGOLDSecure is the certification of gold that guarantees the precious metal’s content, weight and fineness. 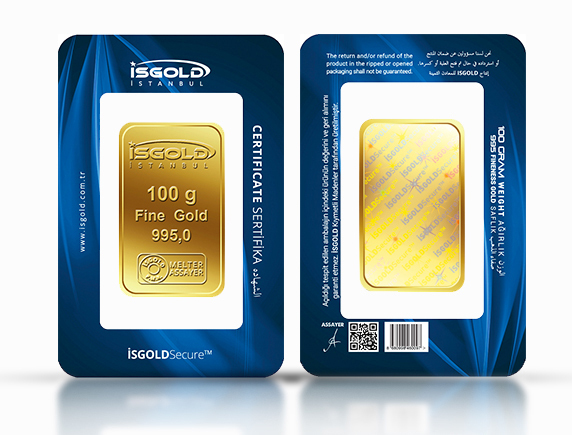 ISGOLDSecure certified packages have waterproof and non-manipulated packaging feature. The packaging is designed as not to open against fraud actions. ISGOLD is committed to achieve ever-increasing levels of customer satisfaction taking into the environmental concern consideration.